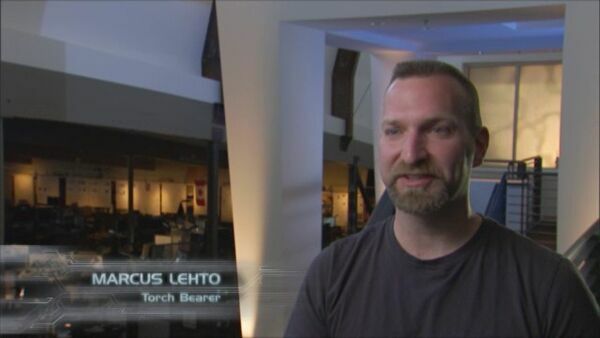 Gears of Halo - Video game reviews, news and cosplay : Is Marcus Lehto the Steve Jobs of Bungie? Steve Jobs is a world wide icon, notable for building Apple Inc into a major computing power, being dumped, starting animation company Pixar and then coming full circle again by being Apple’s CEO and overseeing the development of world class products like the ipod, iphone and the new tablet, the ipad. The consumers, investors and other apple fan freaks hang on every word the Steve Jobs says. His 'one more thing announcements' are legendary and serve the world notice of a new innovation that may just change the playing field, so to speak. Ah, good old drunk posting on a widely read blog. It’s as bad as drunk dialing your ex eh? Or was it? The cynic in me suggests this was a magic marketing trick. Here’s how it works. Make a small statement somewhere and it builds some excitement amongst those who saw it. Build some overnight expectation but then get a reaction when there’s a delay and soon enough everyone starts talking. By which time when you choose to release the bomb, the effect is of the Hiroshima kind. Complete and devasting and then your audience is thus primed and ready to go sup at the well of Full Halo Glory (tm). Bungie have done this before on a much larger scale – remember Halo ODST was actually going to be called Halo 3 : Recon at one stage? While in that situation there was clearly some bigger forces at play, Bungie pulled a massive stunt by building anticipation, dropping the bomb that there would be no announcement which got EVERYONE looking at them and THEN announcing Halo: ODST. This Lehto drama is the same thing in practice, just on a smaller scale. Despite the above reasoning, the great thing about Bungie is their ability to engage with the Halo community by fostering, promoting and their willingness to share the limelight with that community. This of course has lead to a real spirit of love, and peace-loving-mung-beans baby, on a plain so high that when the High Priest of Lehto speaks, all who read his good words drink deeply from the Halo cup with a fervent and loyal obedience. Update: image is now Marcus, cheers Seenoht for the heads up! Jangs, you do know that is Lee Wilson in the picture, not Marcus Lehto, right? He's not Steve Jobs either. I thought he was kinda different I'm blaming google images but my bad! Thanks for the heads up! No prob! Keep on bloggin'!